The Earth's surface lithosphere rides atop the asthenosphere and the two form the components of the upper mantle. The lithosphere is divided into a number of plates that are continuously being created and consumed at their opposite plate boundaries. Accretion occurs as mantle is added to the growing edges of a plate, associated with seafloor spreading. This hot added material cools down by conduction and convection of heat. At the consumption edges of the plate, the material has thermally contracted to become dense, and it sinks under its own weight in the process of subduction usually at an ocean trench. This subducted material sinks through the Earth's interior. Some subducted material appears to reach the lower mantle, while in other regions, this material is impeded from sinking further, possibly due to a phase transition from spinel to silicate perovskite and magnesiowustite, an endothermic reaction. The subducted oceanic crust triggers volcanism, although the basic mechanisms are varied. Volcanism may occur due to processes that add buoyancy to partially melted mantle, which would cause upward flow of the partial melt due to decrease in its density. Secondary convection may cause surface volcanism as a consequence of intraplate extension and mantle plumes. Mantle convection causes tectonic plates to move around the Earth's surface. It seems to have been much more active during the Hadean period, resulting in gravitational sorting of heavier molten iron, nickel, and sulphides to the core and lighter silicate minerals to the mantle. Earth's temperature vs depth. Dashed curve: layered mantle convection. Solid curve: whole-mantle convection. A superplume generated by cooling processes in the mantle. During the late 20th century, there was significant debate within the geophysics community as to whether convection is likely to be "layered" or "whole". Although elements of this debate still continue, results from seismic tomography, numerical simulations of mantle convection and examination of Earth's gravitational field are all beginning to suggest the existence of 'whole' mantle convection, at least at the present time. In this model, cold, subducting oceanic lithosphere descends all the way from the surface to the core–mantle boundary (CMB) and hot plumes rise from the CMB all the way to the surface. This picture is strongly based on the results of global seismic tomography models, which typically show slab and plume-like anomalies crossing the mantle transition zone. Although it is now well accepted that subducting slabs cross the mantle transition zone and descend into the lower mantle, debate about the existence and continuity of plumes persists, with important implications for the style of mantle convection. This debate is linked to the controversy regarding whether intraplate volcanism is caused by shallow, upper-mantle processes or by plumes from the lower mantle. Many geochemistry studies have argued that the lavas erupted in intraplate areas are different in composition from shallow-derived mid-ocean ridge basalts (MORB). Specifically, they typically have elevated Helium-3 – Helium-4 ratios. Being a primordial nuclide, Helium-3 is not naturally produced on earth. It also quickly escapes from earth's atmosphere when erupted. The elevated He-3/He-4 ratio of Ocean Island Basalts (OIBs) suggest that they must be sources from a part of the earth that has not previously been melted and reprocessed in the same way as MORB source has been. This has been interpreted as their originating from a different, less well-mixed, region, suggested to be the lower mantle. Others, however, have pointed out that geochemical differences could indicate the inclusion of a small component of near-surface material from the lithosphere. 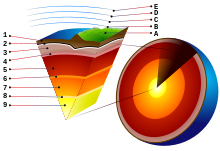 On Earth, the Rayleigh number for convection within Earth's mantle is estimated to be of order 107, which indicates vigorous convection. This value corresponds to whole mantle convection (i.e. convection extending from the Earth's surface to the border with the core). On a global scale, surface expression of this convection is the tectonic plate plate motions, and therefore has speeds of a few cm/a. Speeds can be faster for small-scale convection occurring in low-viscosity regions beneath the lithosphere, and slower in the lowermost mantle where viscosities are larger. A single shallow convection cycle takes on the order of 50 million years, though deeper convection can be closer to 200 million years. Currently, whole mantle convection is thought to include broad-scale downwelling beneath the Americas and the Western Pacific, both regions with a long history of subduction, and upwelling flow beneath the central Pacific and Africa, both of which exhibit dynamic topography consistent with upwelling. This broad-scale pattern of flow is also consistent with the tectonic plate motions, which are the surface expression of convection in the Earth's mantle and currently indicate degree-2 convergence toward the western Pacific and the Americas, and divergence away from the central Pacific and Africa. The persistence of net tectonic divergence away from Africa and the Pacific for the past 250 Myr indicates the long-term stability of this general mantle flow pattern, and is consistent with other studies  that suggest long-term stability of the LLSVP regions of the lowermost mantle that form the base of these upwellings. Since the mantle is primarily composed of olivine ((Mg,Fe)2SiO4), the rheological characteristics of the mantle are largely those of olivine. Additionally, due to the varying temperatures and pressures between the lower and upper mantle, a variety of creep processes can occur with dislocation creep dominating in the lower mantle and diffusional creep occasionally dominating in the upper mantle. However, there is a large transition region in creep processes between the upper and lower mantle and even within each section, creep properties can change strongly with location and thus temperature and pressure. In the power law creep regions, the creep equation fitted to data with n = 3–4 is standard. The strength of olivine not only scales with its melting temperature, but also is very sensitive to water and silica content. The solidus depression by impurities, primarily Ca, Al, and Na, and pressure affects creep behavior and thus contributes to the change in creep mechanisms with location. While creep behavior is generally plotted as homologous temperature versus stress, in the case of the mantle it is often more useful to look at the pressure dependence of stress. Though stress is simple force over area, defining the area is difficult in geology. Equation 1 demonstrates the pressure dependence of stress. Since it is very difficult to simulate the high pressures in the mantle (1MPa at 300–400 km), the low pressure laboratory data is usually extrapolated to high pressures by applying creep concepts from metallurgy. per second. Stresses in mantle are dependent on density, gravity, thermal expansion coefficients, temperature differences driving convection, and distance convection occurs over, all of which give stresses around a fraction of 3-30MPa. Due to the large grain sizes (at low stresses as high as several mm), it is unlikely that Nabarro-Herring (NH) creep truly dominates. Given the large grain sizes, dislocation creep tends to dominate. 14 MPa is the stress below which diffusional creep dominates and above which power law creep dominates at 0.5Tm of olivine. Thus, even for relatively low temperatures, the stress diffusional creep would operate at is too low for realistic conditions. Though the power law creep rate increases with increasing water content due to weakening, reducing activation energy of diffusion and thus increasing the NH creep rate, NH is generally still not large enough to dominate. Nevertheless, diffusional creep can dominate in very cold or deep parts of the upper mantle. Additional deformation in the mantle can be attributed to transformation enhanced ductility. Below 400 km, the olivine undergoes a pressure induced phase transformation into spinel and can cause more deformation due to the increased ductility. Further evidence for the dominance of power law creep comes from preferred lattice orientations as a result of deformation. Under dislocation creep, crystal structures reorient into lower stress orientations. This does not happen under diffusional creep, thus observation of preferred orientations in samples lends credence to the dominance of dislocation creep. A similar process of slow convection probably occurs (or occurred) in the interiors of other planets (e.g., Venus, Mars) and some satellites (e.g., Europa, Enceladus). ^ Kobes, Randy and Kunstatter, Gabor. "Mantle Convection". Physics Department, University of Winnipeg. Retrieved 3 January 2010. ^ Ricard, Y. (2009). "2. Physics of Mantle Convection". In David Bercovici and Gerald Schubert. Treatise on Geophysics: Mantle Dynamics. 7. Elsevier Science. ISBN 9780444535801. ^ Gerald Schubert; Donald Lawson Turcotte; Peter Olson (2001). "Chapter 2: Plate tectonics". Mantle convection in the earth and planets. Cambridge University Press. pp. 16 ff. ISBN 978-0-521-79836-5. ^ Fukao, Yoshio; Obayashi, Masayuki; Nakakuki, Tomoeki; Group, the Deep Slab Project (2009-01-01). "Stagnant Slab: A Review". Annual Review of Earth and Planetary Sciences. 37 (1): 19–46. Bibcode:2009AREPS..37...19F. doi:10.1146/annurev.earth.36.031207.124224. ^ Gerald Schubert; Donald Lawson Turcotte; Peter Olson (2001). "§2.5.3: Fate of descending slabs". Cited work. pp. 35 ff. ISBN 978-0-521-79836-5. ^ a b Kent C. Condie (1997). Plate tectonics and crustal evolution (4th ed.). Butterworth-Heinemann. p. 5. ISBN 978-0-7506-3386-4. ^ Moresi, Louis; Solomatov, Viatcheslav (1998). "Mantle convection with a brittle lithosphere: thoughts on the global tectonic styles of the Earth and Venus". Geophysical Journal International. 133 (3): 669–82. Bibcode:1998GeoJI.133..669M. CiteSeerX 10.1.1.30.5989. doi:10.1046/j.1365-246X.1998.00521.x. ^ Ctirad Matyska & David A Yuen (2007). "Figure 17 in Lower-mantle material properties and convection models of multiscale plumes". Plates, plumes, and planetary processes. Geological Society of America. p. 159. ISBN 978-0-8137-2430-0. ^ Donald Lawson Turcotte; Gerald Schubert (2002). Geodynamics (2nd ed.). Cambridge University Press. ISBN 978-0-521-66624-4. ^ Gerald Schubert; Donald Lawson Turcotte; Peter Olson (2001). Cited work. p. 616. ISBN 978-0-521-79836-5. ^ Montelli, R; Nolet, G; Dahlen, FA; Masters, G; Engdahl ER; Hung SH (2004). "Finite-frequency tomography reveals a variety of plumes in the mantle". Science. 303 (5656): 338–43. Bibcode:2004Sci...303..338M. doi:10.1126/science.1092485. PMID 14657505. ^ Lithgow-Bertelloni, Carolina; Silver, Paul G. (1998). "Dynamic topography, plate driving forces and the African superswell". Nature. 395 (6699): 269–272. Bibcode:1998Natur.395..269L. doi:10.1038/26212. ISSN 0028-0836. ^ a b Conrad, Clinton P.; Steinberger, Bernhard; Torsvik, Trond H. (2013). "Stability of active mantle upwelling revealed by net characteristics of plate tectonics". Nature. 498 (7455): 479–482. Bibcode:2013Natur.498..479C. doi:10.1038/nature12203. ISSN 0028-0836. PMID 23803848. ^ Torsvik, Trond H.; Smethurst, Mark A.; Burke, Kevin; Steinberger, Bernhard (2006). "Large igneous provinces generated from the margins of the large low-velocity provinces in the deep mantle". Geophysical Journal International. 167 (3): 1447–1460. Bibcode:2006GeoJI.167.1447T. doi:10.1111/j.1365-246x.2006.03158.x. ISSN 0956-540X. ^ Torsvik, Trond H.; Steinberger, Bernhard; Ashwal, Lewis D.; Doubrovine, Pavel V.; Trønnes, Reidar G. (2016). "Earth evolution and dynamics—a tribute to Kevin Burke". Canadian Journal of Earth Sciences. 53 (11): 1073–1087. Bibcode:2016CaJES..53.1073T. doi:10.1139/cjes-2015-0228. ISSN 0008-4077. ^ Dziewonski, Adam M.; Lekic, Vedran; Romanowicz, Barbara A. (2010). "Mantle Anchor Structure: An argument for bottom up tectonics". Earth and Planetary Science Letters. 299 (1–2): 69–79. Bibcode:2010E&PSL.299...69D. doi:10.1016/j.epsl.2010.08.013. ISSN 0012-821X. ^ Weertman, J.; White, S.; Cook, Alan H. (1978-02-14). "Creep Laws for the Mantle of the Earth [and Discussion]". Philosophical Transactions of the Royal Society of London A: Mathematical, Physical and Engineering Sciences. 288 (1350): 9–26. Bibcode:1978RSPTA.288....9W. doi:10.1098/rsta.1978.0003. ISSN 1364-503X. ^ a b Borch, Robert S.; Green, Harry W. (1987-11-26). "Dependence of creep in olivine on homologous temperature and its implications for flow in the mantle". Nature. 330 (6146): 345–48. Bibcode:1987Natur.330..345B. doi:10.1038/330345a0. ^ Karato, Shun-ichiro; Wu, Patrick (1993-05-07). "Rheology of the Upper Mantle: A Synthesis". Science. 260 (5109): 771–78. Bibcode:1993Sci...260..771K. doi:10.1126/science.260.5109.771. ISSN 0036-8075. PMID 17746109.